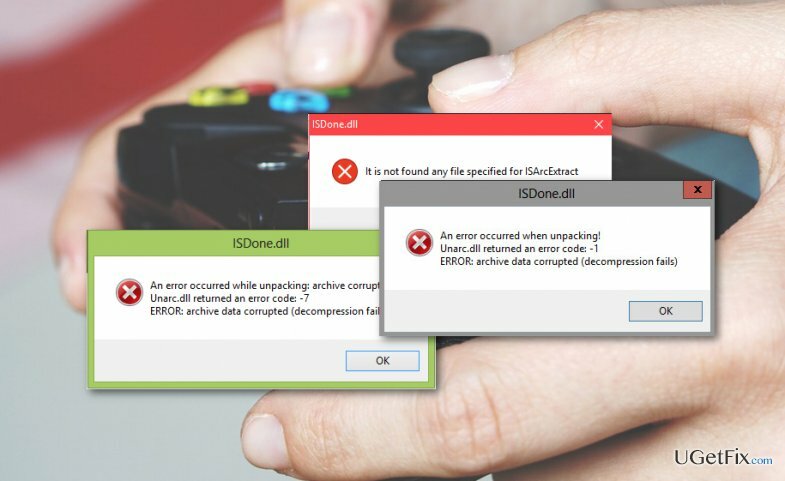 How to fix ISDone.dll error? Home »	Fix » How to fix ISDone.dll error? Issue: How to fix ISDone.dll error? Can’t run Battlefield Hardline! The isdone.dll error keeps popping up, staying that isdone.dll was not found or something along those lines. Can this issue be fixed? Will I be able to run the game at all? The video game market is continuously growing, and, with the arrival of various alternative gaming approaches, it not expected to stop anytime soon. Nevertheless, PC gaming is still one of the most widespread approaches. It is also a challenging one. Numerous problems may occur when installing new games on the computer. Of course, there is a smaller chance of that happening when installing legal applications. Nevertheless, it is not a secret that Gamers tend to download pirated games or use illegal cracks to enable full versions of certain games. Such users are much more likely to have their devices exposed to major system problems and even malware infection. We should remind you that downloading pirated content is illegal and punishable by law. “Isdone.dll file is missing or not found” error usually occurs when running pirated applications, BUT it also possible that a legitimate application has been corrupted and, thus, displays these errors. The error can also occur if some programs on the computer interfere with the newly installed application’s script. Either way, this error is not lethal and can be bypassed quite easily in order to run the game. Besides, it is also noticeable that Isdone.dll error goes almost interchangeably with another DLL error, known as unarc.dll. Both of these errors reportedly occurred in games including Far Cry 4, FIFA 15 and 16, Fallout 4 and a few others. The guidelines we present below can be used to fix both Isdone.dll and unarc.dll errors. Paste the file into the corresponding folder, e.g. : C:> Windows> SysWOW64. In case you use 32-bit operating system, paste the file into the C:> Windows>system32 directory. Reboot the computer and reinstall the game. Usually, various applications start malfunctioning when they are outdated. Thus, you should update your desired application with the latest patches. Also, check whether the computer is running compatible graphics drivers and also make sure that your device capacities correspond to the game requirements. If you are using an illegal, pirated or cracked version of a game, it is not surprising that you are experiencing errors like Isdone.dll. In fact, it is the least that could happen when installing a software which has been modified and brought to you by hackers. Not to risk your computer health and security, remove such a program immediately and scan your device with antivirus software, for instance, Reimage. Then, obtain a legal version of the game. If you install it properly, the Isdone.dll issue should not reoccur.